It’s all personal: Sharif’s visit came four months after the prime minister convincingly won a fair and free election and returned to power for a third time. In Washington, he successfully sought to project himself as a serious and competent leader with whom the United States could effectively do business. He brought a high powered civilian team, but deliberately excluded senior military representatives from his delegation. This was in all likelihood designed to show his hosts that although the Pakistan Army continues to play a key role in determining foreign and security policy, he as prime minister is the go-to person on these matters. Elected in important measure because of widespread popular anguish over the previous government’s failure to deal with Pakistan’s massive economic problems, in particular its worsening power shortages, he focused on these issues and sought U.S. government and private sector assistance in dealing with them. 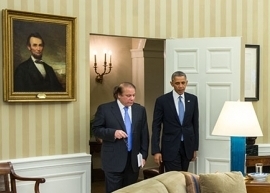 President Obama and his senior administration colleagues gave Sharif the personal attention and respect which for the prime minister and other Pakistanis are key ingredients in developing a trusting relationship. The president afforded Sharif an unusual amount of “face time” at the White House and the chemistry between the two leaders was reportedly good. A string of other events deepened this personal, top-level engagement – breakfast with Vice President Biden for Sharif; tea and a poetry reading with Michelle Obama and Dr. Jill Biden for his wife; meetings with five other Cabinet-level officials; two dinners in their honor. The standard U.S. formula for official visits is often shorter on personal contact than Pakistanis are comfortable with. This was an exception. Afghanistan: The U.S. side sought to convey to Sharif that Washington’s stake in strong bilateral relations goes well beyond a need for Pakistan’s help in achieving its goals in Afghanistan, the original reason for reviving close security and political relations after 9/11. The issue of U.S. reliability has been a sore point for the Pakistanis. Many of them bitterly recall the abrupt termination of similarly close relations when in their view Washington twice concluded it no longer needed Pakistan’s support to further its own policies in the broader South and Central Asian region. Pakistanis are also fearful that India’s growing political and economic strength will relegate them to a minor place in U.S. security calculations. Afghanistan had pride of place in the White House discussions. The two sides have different postwar goals there. The United States wants an independent, stable Afghanistan that maintains good relations with its neighbors under a reasonably representative government. While Pakistanis share these objectives, their top priority is to limit Indian political influence in Afghanistan and avoid being caught in a pincer between two unfriendly neighbors. It is unlikely that the two sides explored these fundamental differences in strategic objectives in the Washington talks. But they did agree on the most desirable end state for Afghanistan: a stable state achieved through an “Afghan-led and Afghan-owned reconciliation process.” The Americans welcomed Pakistani assurances that they favored some post-2014 U.S. non-combat military presence in the country, opposed the return of the Taliban to power, had no political ambitions there themselves, and wanted Afghanistan’s neighbors (i.e. India) to similarly desist from interfering in the country. The U.S. decision just before the visit to move forward on some $1.6 billion in security assistance that had been blocked since the Osama bin Laden raid undoubtedly made the U.S. messages more welcome to the Pakistanis. Kashmir and India: Nawaz Sharif’s last official visit to Washington came on July 4, 1999, when he arrived uninvited to seek President Clinton’s support in an armed conflict with India in Kashmir that Pakistan had started and was on the verge of losing. Clinton told Sharif sternly to get his troops back into Pakistan-administered territory. Only then would he be willing to “take an interest” in Kashmir. (In the event the president did nothing much.) This experience did not deter Sharif from once again seeking U.S. help in moving forward to resolve the Kashmir issue during his current visit. He could not have been surprised when he received no encouragement from the Obama administration, which continued to offer the longstanding U.S. policy of urging the two sides to resolve the issue peacefully and bilaterally, while limiting America’s role in Kashmir to crisis management. Sharif’s raising the Kashmir issue annoyed the Indians, especially as armed activity in the disputed area has recently risen. On the other hand, he placed considerable stress on his government’s commitment to improving Pakistan’s troubled ties with India, albeit without giving any specific undertakings about issues like trade. Big Economic Push: Most U.S.-Pakistan summits have had a heavy political and security focus. This one was unusual in the level of emphasis the Pakistanis put on the economic relationship. Nawaz Sharif stressed this in both public speeches and private discussions. Although he did not say so, these ties could emerge as the centerpiece of the elusive “new beginning” in U.S.-Pakistan ties. Building up business and economic links would give the two countries something they urgently need: an agenda and a source of dynamism that have nothing to do with Afghanistan. In making his pitch, Sharif highlighted his big plans for the Pakistani economy and his equally big hopes for U.S.-Pakistan business and energy ties. He urged the United States to fund new dams to help end Pakistan’s energy crisis. His first public speech was to the U.S.-Pakistan Business Council, where he called for a major increase in private foreign investment but also acknowledged that Pakistan would need to improve the security environment for such business ventures. He made a major appeal for help with Pakistan’s overburdened and obsolescent infrastructure. There and elsewhere in Washington, he also revived Pakistan’s longtime request for greater access for its textile exports to the U.S. market. As he must have been advised, this is a uniquely difficult request for Washington since it requires legislation that American domestic politics almost certainly rule out. But the U.S. side was prepared to discuss ways to provide tariff relief to potential Pakistani non-textile exports. Reflecting Sharif’s interest, the joint statement he issued with President Obama included no fewer than five substantial paragraphs on economic issues. These included an undertaking to direct U.S. and Pakistani senior officials to develop a joint action plan to expand bilateral trade and investment flows over the next five years. Not surprisingly, Pakistani calls for U.S. assistance in the construction, rehabilitation, and modernization of dams and power plants loomed large in the joint statement and elsewhere. Reflecting this interest, Sartaj Aziz, a veteran political leader and former finance minister who serves as the prime minister’s foreign policy adviser and accompanied him to Washington, told a group of American South Asia specialists that he would personally like to see all remaining funds authorized by the five-year U.S.-Pakistan assistance program devoted to a single large-scale hydroelectric dam. He argued that such a high-visibility project would benefit both Pakistan and the United States, whose economic assistance efforts would win greater public recognition than they do now. The missing ingredient: From Nawaz Sharif’s point of view, the most conspicuous omission was any agreement to end U.S. drone attacks in Pakistan. The Amnesty International report criticizing the U.S. drone campaign came out just as Sharif was about to reach Washington. The U.S. response stressed that in practice, attacks have diminished. The absence of a promise to stop probably did not surprise the Pakistanis. The Washington Post front-paged the story about the depth of Pakistani involvement in the drone program just as Sharif was leaving; this will probably add to the political challenge he faces at home in dealing with that neuralgic issue.